Farmers have demanded that the Sewage treatment plant envisaged to be built at Halga must be shifted elsewhere and their land acquired must be returned to the farmers. 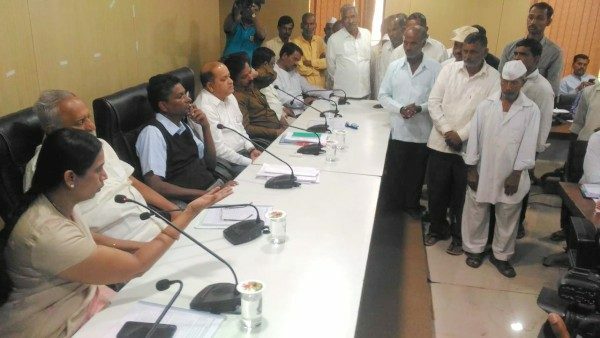 The farmers raised this concern at the meeting called by minister Satish Jarkiholi to discuss the issue of land acquisition to set-up a sewage treatment plant (STP). Belagavi City Corporation (BCC) has planned to set-up an STP on 17 acres and 30 guntas of land at Halaga village, close to Suvarna Vidhana Soudha (SVS). Earlier this STP was to be set up at Alarwad but due to infeasibility report, the plan was shifted to alga and the 21 farmers from whom the land has been acquired have approached the court against the acquisition. The meeting also witnessed a high volume verbal clash between Belagavi Rural MLA Laxmi Hebbalkar and Belagavi South MLA Abhay Patil. Hebbalkar was furious as to why land in Rural constituency are to be acquired already the farmers have given land for the SVS and suggested the STP could be shifted to Khasbag. Replying to the Hebbalkar, South MLA Patil said he is not here to discuss politics but for development and if need be I will convince the people of my area if the land is required. Farmers at the meeting said they had no choice but to commit suicide if their fertile land was acquired for STP. CCB Commissioner Kurer said that, in 2015, 19 acres of land was identified in Halga for the STP under the AMRUT scheme and Rs.1.12 crore compensation was awarded. But work could not be started as the farmers approached the court. In 2017 the court rejected the farmers plea but due to protests work hasn’t been started. A committee will now be formed which will also have farmers on board to come to a solution.